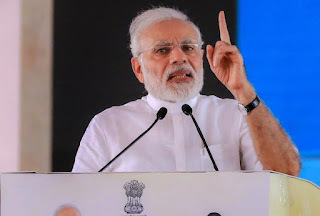 In the last four years, since the election of Narendra Modi to power in 2014, India has beaten four big economies to secure its position as the world’s sixth largest economy, pipping France this year, the World Bank said. The country will likely beat the United Kingdom by the end of this year if the GDP growth continues its 7% plus trajectory. In 2014, India was at the 10th spot, behind the United States, China, Japan, Germany, the United Kingdon, France, Brazil, Italy, and Russia. With a consistent GDP 7% plus growth, except in the financial year 2017-18, India left behind France, Brazil, Italy, and Russia. Between 2011 and 2014, India’s remained at the 10th rank for four continuous years. India, with a total GDP of $2.597 trillion at the end of the year 2017, is just $25 billion behind the United Kingdom, according to the World Bank. The International Monetary Fund (IMF) projects India to grow at 7.4% in the current year 2018 and 7.8% in 2019, leaving its nearest rival China behind at 6.6 and 6.4% respectively. BofA Merrill Lynch Global Research projects that India can surpass Germany and Japan in nominal GDP in dollar term by 2028. India is also expected to be a $6 trillion economy — the third largest in the world — in the next 10 years, majorly helped by digitisation, a report by Morgan Stanley said. However, while India is growing fast and leaving developed countries behind, the per capita income continues to be minuscule as compared to them. India’s per capita income is just $2,130, while that of France is $44,930, Brazil is $10,220, Italy is $35,910, and Russia is $11,950, as per the IMF. India is 126th in terms of per capita income, one rank up from 2016, as per latest data. And while India’s huge population continues to put pressure on country’s resources, income inequality is a big issue too. Oxfam survey earlier this year found that India’s richest 1% own 73% of wealth generated in India. With India expected to surpass China’s total population by 2024, the policymakers will have a tough challenge in not only making India grow at a faster rate but also to ensure an inclusive growth.